/poi·son oak/ (ōk) Rhus diversiloba or R. toxicodendron. 1. Either of two plants, Toxicodendron pubescens, a shrub of the southeast United States, or T. diversilobum, a shrub or vine of western North America, having compound leaves with three lobed or toothed leaflets, and causing a rash on contact. 3. A skin rash caused by contact with one of these plants. any of several species of shrub of the genus Rhus, common in North America. Skin contact results in allergic dermatitis in many people. 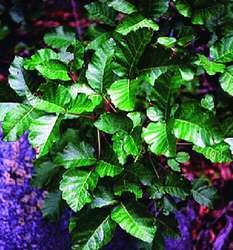 The characteristics and treatment of the condition are similar to those of poison ivy. See also poison ivy, rhus dermatitis, urushiol. A type of hypersensitivity dermatitis caused by Rhus diversiloba–western poison oak, and R quercifolia–eastern poison oak. See Poison ivy. 2. Common name for the cutaneous eruption caused by contact with these species of Toxicodendron. A climbing vine, Toxicodendron diversiloba, closely related to poison ivy and having the same active substances. a substance that, on ingestion, inhalation, absorption, application, injection or development within the body, in relatively small amounts, may cause structural damage or functional disturbance. Corrosives are poisons that destroy tissues directly. They include the mineral acids, such as nitric acid, sulfuric acid and hydrochloric acid, and the caustic alkalis, such as ammonia, sodium hydroxide (lye), sodium carbonate and sodium hypochlorite; and carbolic acid (phenol). Irritants are poisons that inflame the mucous membranes by direct action. These include copper sulfate, salts of lead, cantharidin, oxalate raphides, and many plant and insect poisons. Nerve toxins act on the nerves or affect some of the basic cell processes. This large group includes the narcotics, such as opium, heroin and cocaine, and the barbiturates, anesthetics and alcohols. Blood toxins act on the blood and deprive it of oxygen. They include carbon monoxide, carbon dioxide, hydrocyanic acid and the gases used in chemical warfare. Some blood toxins destroy the blood cells or the platelets. See also poisoning and names of individual poisons. public facility set up to provide information around the clock to provide information on toxicity of substances and current information of correct first aid methods and antidotes for poisoning emergencies. see bee sting, epicauta vittata, tick paralysis. trematomentosa. Called also peach-leaf poison bush. Russel, in Order of the Poison Oak, goes skinny-dipping. 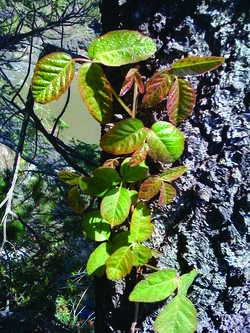 Attempts have been made in the past to develop tolerance through oral ingestion of dilutions of poison ivy and poison oak extract, but these were unsuccessful in developing long-term tolerance and resulted in many side effects such as pruritus ani, hives, blisters, or dermatitis (Epstein, 1994; Tanner, 2000). Leaves of three, let them be: if it were only that easy! Some people call eastern poison oak "oak leaf poison ivy," and others use the terms poison ivy and poison oak pretty much interchangeably. Poison ivy, poison oak and poison sumac grow almost everywhere in the United States, except Hawaii, Alaska and some desert areas of Nevada. I've had people eat poison oak to get their bodies immune to it," says Ade. Get acquainted with poison oak and poison sumac, too, however less common they may be in your particular neck of the woods. Their names even sound terrible: poison ivy, poison oak, and poison sumac. Other members of this family include poison oak and sumac. Poison ivy and poison oak do have three leaves per cluster, but poison sumac ranges from seven to 13 leaves per branch," warns Pulido. No roots or bushes with briars will be accepted; harmful plants, like poison ivy, poison oak or poison sumac will not be accepted; and, no commercial loads will be accepted. Itch-X works instantly for the temporary relief of pain and itching associated with insect bites, rashes, allergic reactions, hives, dry skin, poison ivy and poison oak. A Eugene man fighting the Douglas Complex fires in Douglas County was injured and taken to a hospital early Tuesday after suffering an allergic reaction to smoke inhaled from burning poison oak, his employer said.